A weekend getaway with the family was in the works. A new destination with plenty of adventure. 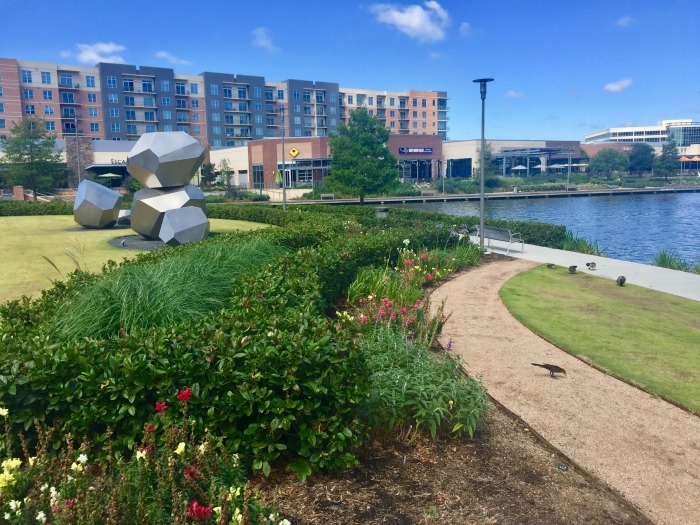 The Woodlands TX did not disappoint and I’m so glad to share my travels with you in this sponsored post. I’ve driven down Interstate 45 in Texas many times over the years. Heading to Galveston to start a cruise adventure. Or to visit friends in Houston. I’ve always seen the signs, for just a few exits, marking what I considered to be a suburb north of Houston – The Woodlands TX. What I didn’t realize was that what I saw alongside the freeway, really hid a lesser known travel destination in Texas. 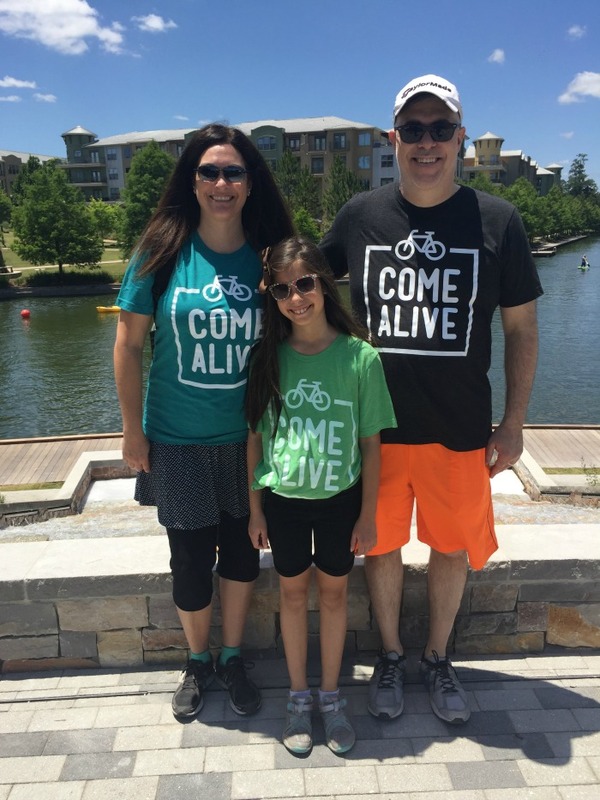 The Woodlands TX is one place you’ll want to make plans to visit now…and definitely bring the family. 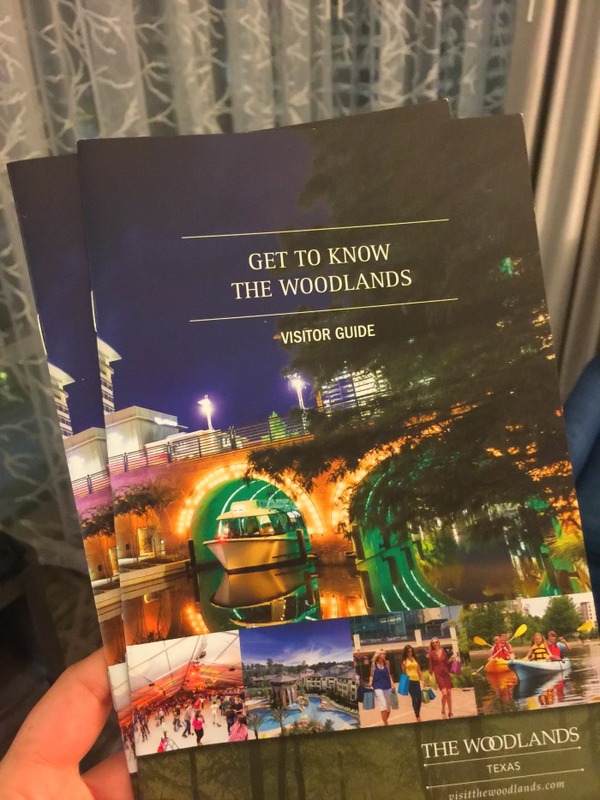 Why Visit The Woodlands TX? The Woodlands TX was named by Travel + Leisure as one of America’s “Coolest Suburbs Worth a Visit”. It’s easy to see why, but only AFTER you pull off of the interstate and start driving the roads lined with incredibly tall trees. It’s only then that you’ll discover why The Woodlands is so aptly named and then gasp at the beauty and nature hidden right in the middle of a residential community. What I discovered is that I didn’t have to venture far away from a city to find the peacefulness I so crave while on a vacation. It was so close to a freeway, a mall, and a million chain restaurants…but so perfectly hidden. Follow along as I take you with me on our weekend getaway! 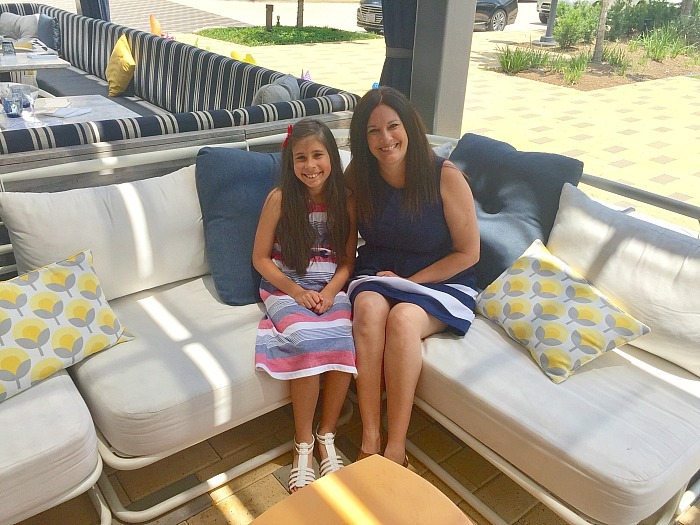 While sometimes I just want to visit a resort and never leave (The Woodlands has a wonderful selection of resorts to do just that), this was a weekend I wanted to actively enjoy with my family. I wanted adventure. I wanted excellent food. And I wanted a trip that would make everyone smile and leave with memories made. A trip that pleases both adults and one tween? Yes! Some might consider that a challenge, but The Woodlands was up for it! For those of you who have been following along on my adventures, you’ll recall that I first kayaked last fall. You might also recall that I was scared to death. I’d never been before and I was in a single person kayak, but truth be told it was knowing I was in the middle of alligator country that was unsettling. Kayaking was something I’ve wanted to do again and I was giddy with excitement when I found out that I could do it right in the middle of The Woodlands. 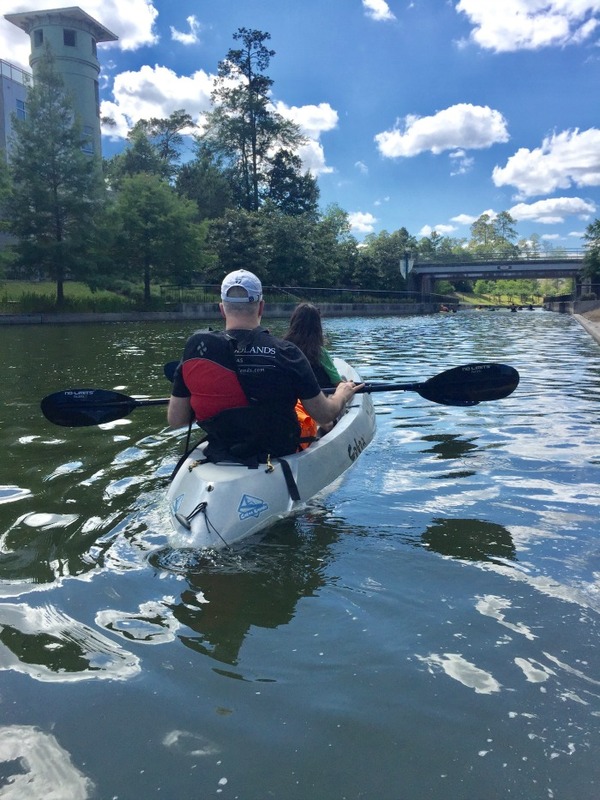 While there were likely many water venues which would surely be more adventurous (aka more wildlife), thanks to Riva Row Boat House, this was kayaking in the middle of a town, just steps away from an upscale shopping center and luxury homes. I introduced my daughter to the adventure I love so much as she and my husband headed off after a quick lesson from staff in a tandem kayak. Her fear of the unknown settled into wanting to race me! Another kayak-er in the family! I couldn’t be happier. As a parent, I liked that this wasn’t kayaking in the middle of nowhere. If we had needed help, there were plenty of fellow adventurers around (both in kayaks and on paddle-boards)! NOTE: Riva Row Boat House does provide life jackets and small-ish waterproof bags to protect your phone/wallet. There are lockers on scene, but you must bring your own locks. I have used this waterproof phone case on trips recently and my photos turned out great through the plastic! Highly recommended as it can hang around your neck. 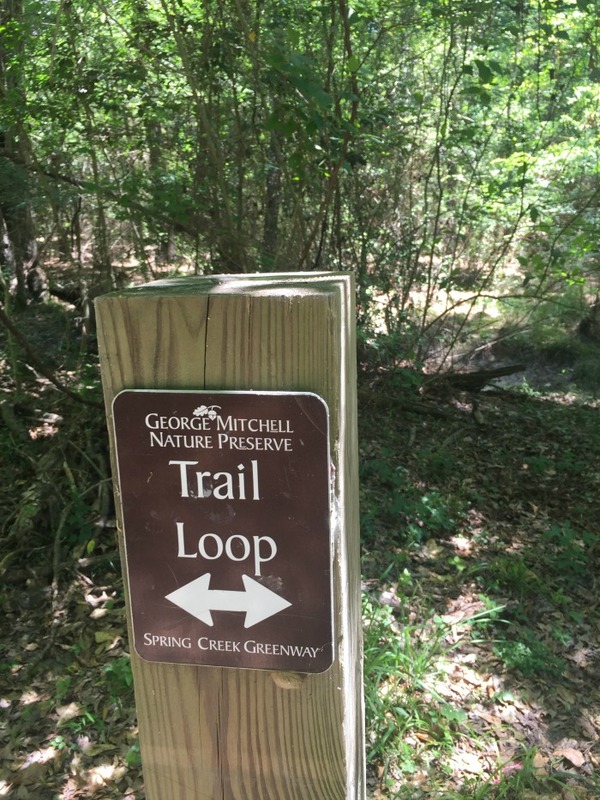 We were definitely getting our activity during this weekend trip, and ventured out to the George Mitchell Nature Preserve. Covering approximately 1700 acres, the preserve offers 3 miles of bike trails which are found within a 2-mile main hiking loop. The preserve parking area sits off of a main road and is a gravel area that likely will accomodate 8-10 vehicles. Though we knew we weren’t alone from the cars in the parking area, we only occasionally saw others. Funny Story: We actually ran into a family we knew from Dallas on this hike! Open from dawn till dusk, you’ll be rewarded mid-way with a view of Bedias Lake. You’ll spy beautiful trees and maybe even a cute creature or two (my daughter delighted in that)! Wear good shoes – the walking/hiking surface, though entirely flat, has a lot of tree roots that are above ground. One could easily trip, so keep an eye on those who might not do well on unsteady ground. Avoid bringing a stroller – there are areas of sand throughout, making travel with a stroller difficult (though we did see one family who did). Take a photo of the hiking maps on display BEFORE you begin your hike – there are a few trails and we might have had to backtrack once or twice. The great thing about not being so far off the beaten path, is that you aren’t very far from a little shopping and fine dining! We headed to Market Street for just that. Market Street is an outdoor mall within walking distance to the Riva Row Boat House (and in fact, we grabbed a quick bite to eat before our kayak time there). From hotels and restaurants to a movie theater and shopping at some of my favorite stores (think Kendra Scott, Alex and Ani, and Z Gallerie), you’ll find it all at Market Street. We are totally guilty of visiting more than once! A great place to stroll for date night, shop with the girlfriends, or hang out with the kids. 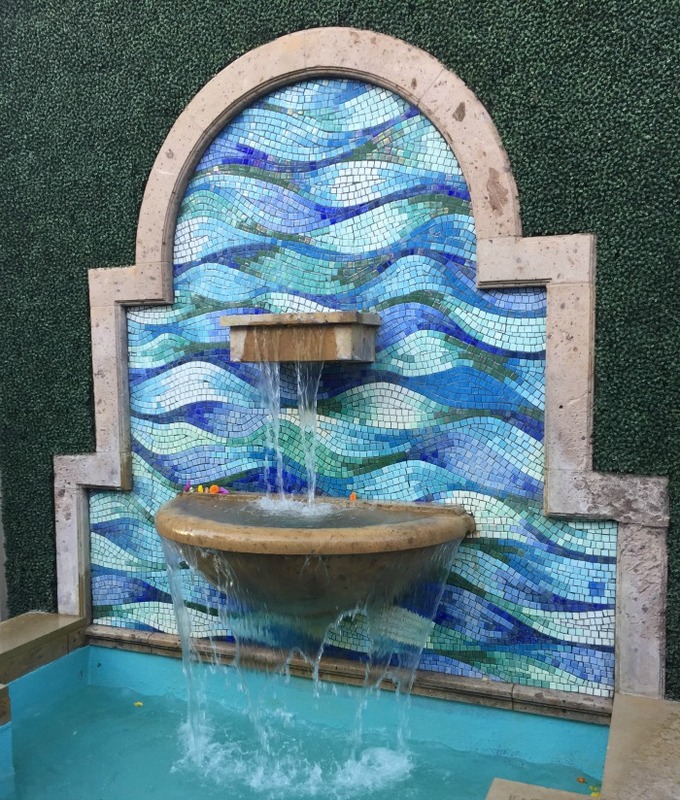 There was something unique at every turn, from fountains and special lighting to art sculptures. Because Market Street was so amazing, that is exactly where you could find us Saturday night for dinner. 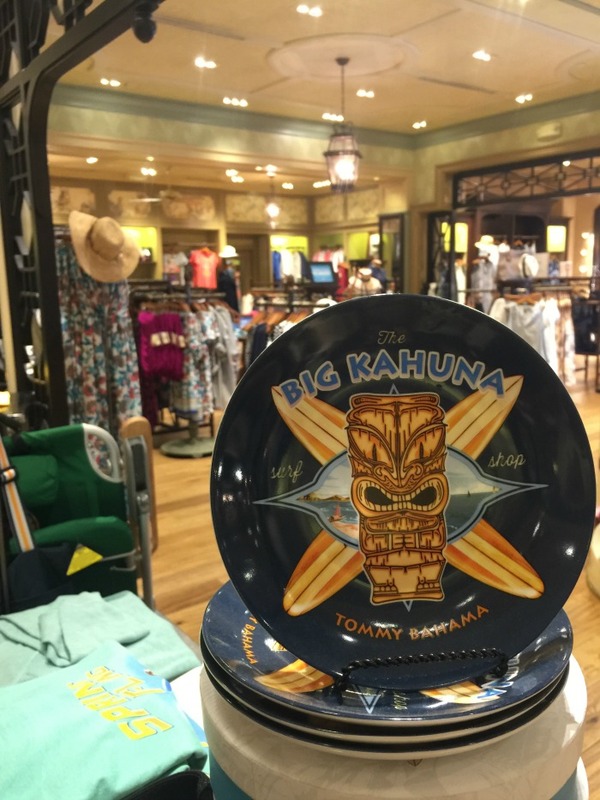 My husband has always adored shopping in Tommy Bahama stores, but one thing we didn’t know is that Tommy Bahama actually has restaurants around the globe. 17 restaurants in fact, from Tokyo (Japan) to Hawaii and Florida to New York. And one location worth mentioning here…The Woodlands TX! 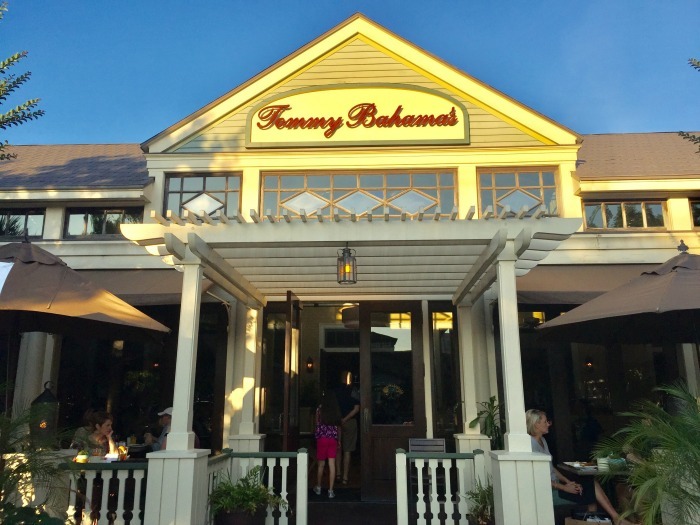 Nestled just steps away from an outdoor area where families were gathered to rest and enjoy the early evening, we discovered Tommy Bahama’s! Lanterns lit the patio areas as we walked in. One thing I quickly noticed…there were several areas to eat in at this restaurant and each was distinct. Basically there was an area for everyone. As a family of 3, the inside patio area was perfect. With plenty of windows, ceiling fans, bird-themed wallpaper and a seemingly thatched roof (I’m sure it wasn’t really), it was beautiful. I felt like we were a million miles away. Seared Scallop Sliders – with aioli, crispy onions and island slaw, this was DELISH! Parmesan Crusted Sanibel Chicken – apparently this is famous! 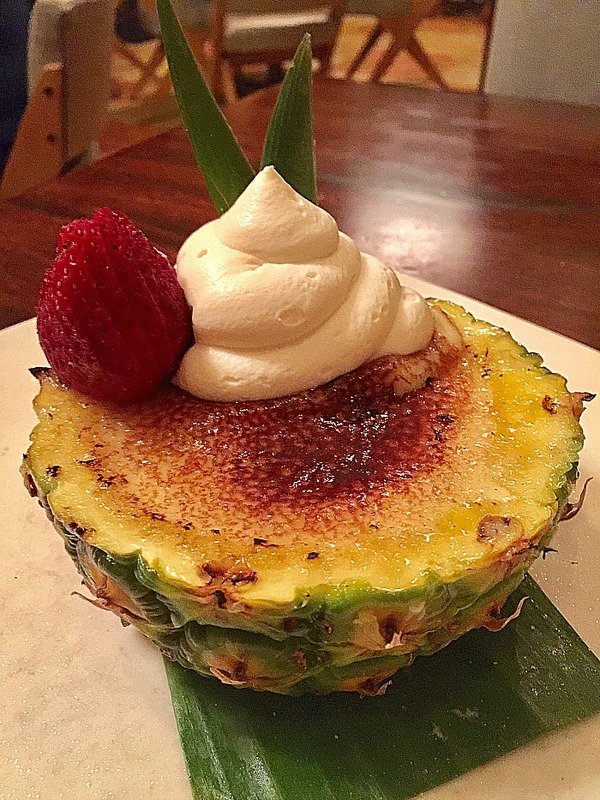 Pineapple Creme Brulee – Oh My Word! And it came in an actual pineapple as you can see above! This was the most summery dessert EVER! Peanut Butter Pie – um yes, with a pretzel crust and hawaiian sea salt no doubt! Pina Colada Cake – with diced pineapple and toasted coconut, my daughter was smiling! Let’s just say this meal was so incredible that I cannot wait for one to open in the Dallas/Ft Worth area this summer! But for those of you close to The Woodlands…make plans for date night (and make reservations as it was popular)! 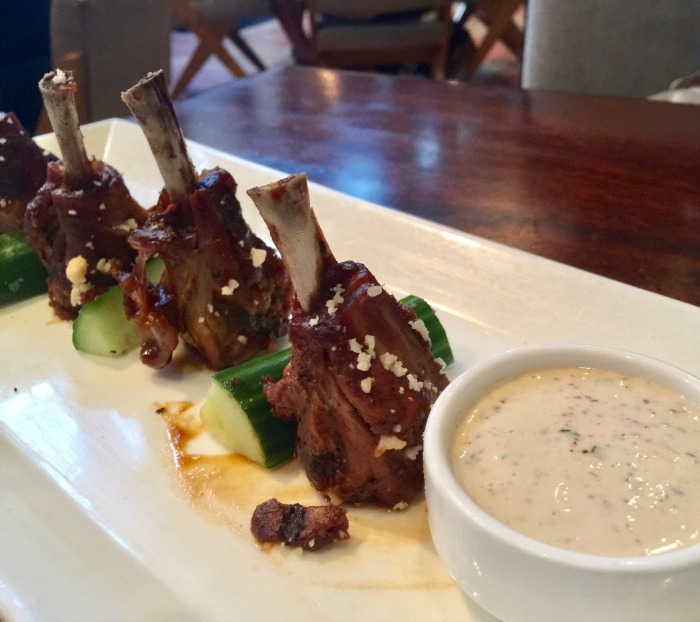 We were WOW’d by one other local restaurant in The Woodlands during our getaway – Fielding’s Local Kitchen + Bar. It was hard not to be impressed with this upscale restaurant as we were greeted with such a warm welcome. It was Mother’s Day brunch after all, and the place was decorated to reflect that. With ornamental fans delicately hanging from the ceiling and extra large pinwheels in the garden area to recently hung chipboard reminders to call your mom, I was immediately at home. Of course, it was hard to get me off the comfortable seating on the patio once our reservation was called. Bright yellow and navy blue colors welcomed guests and you didn’t quite mind if it was warm outside or not. A quick note that locals were bringing their mothers here. A sure sign that this was a great place for brunch. They weren’t wrong (as evidenced by my empty plate of Cream Cheese Lemon Pancakes)! We spent some time talking with the owner about his family, his passion for locally sourced food, and the namesake of his restaurant (Fielding was his son Hunter’s great-grandfather). 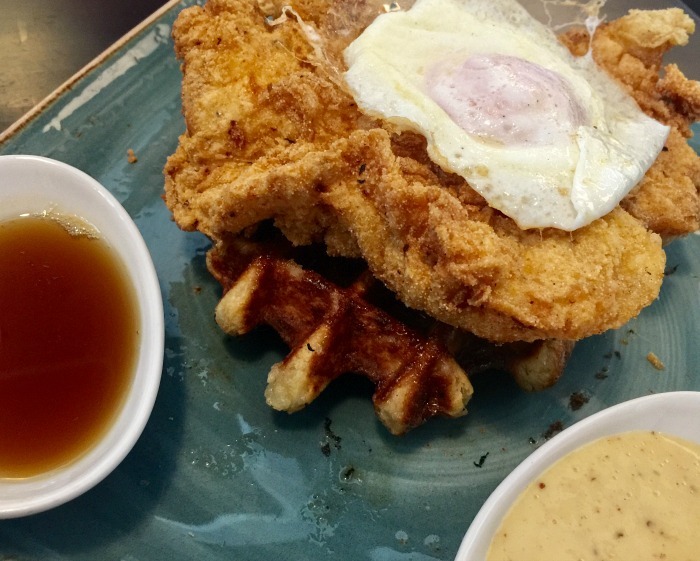 One of the entrees we ordered was the Chicken & Waffle with Fried Egg. This was the epitome of fresh. I thought I had tasted chicken before. I had not. This was what chicken was meant to taste like – fresh, straight from the farm. It was incredible. 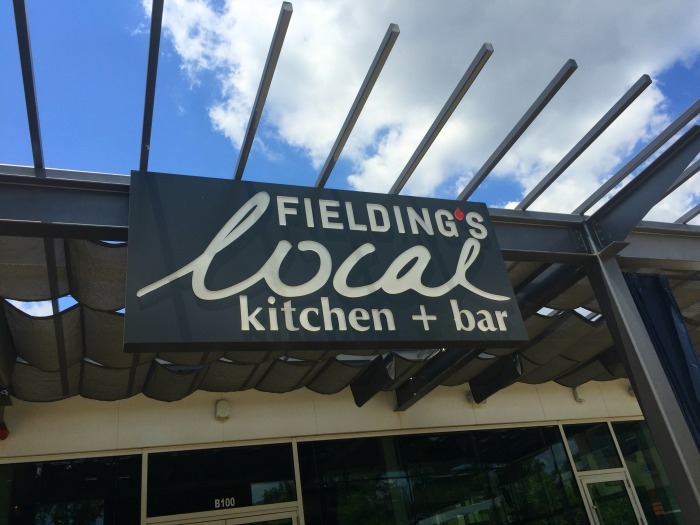 That is exactly the reason why Fielding’s Local Kitchen + Bar sources it’s food from places like 44 Farms, Houston Dairymaids, and Mill King Family Creamery. And though I maybe should have, when they insisted we order the Mother’s Day special dessert, I didn’t say no! 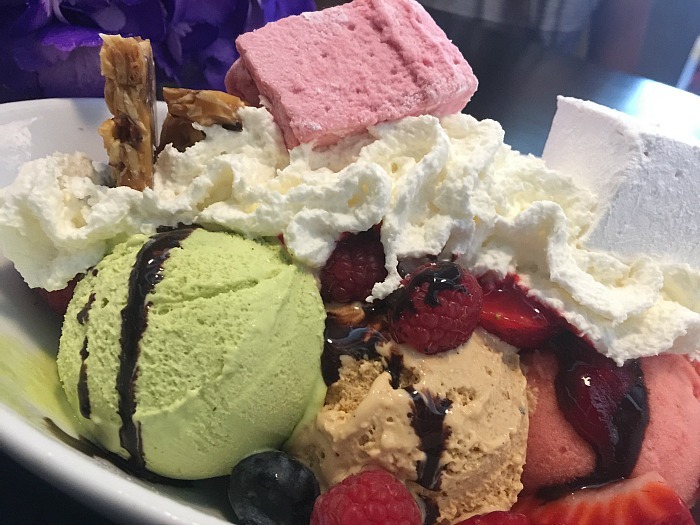 The Incredible Neapolitan Sundae arrived and we gasped. It was heaven in a bowl with both gelato and sorbet, fresh berries and chantilly cream, raspberry coulis and almond brittle, vanilla marshmallow and cocoa. 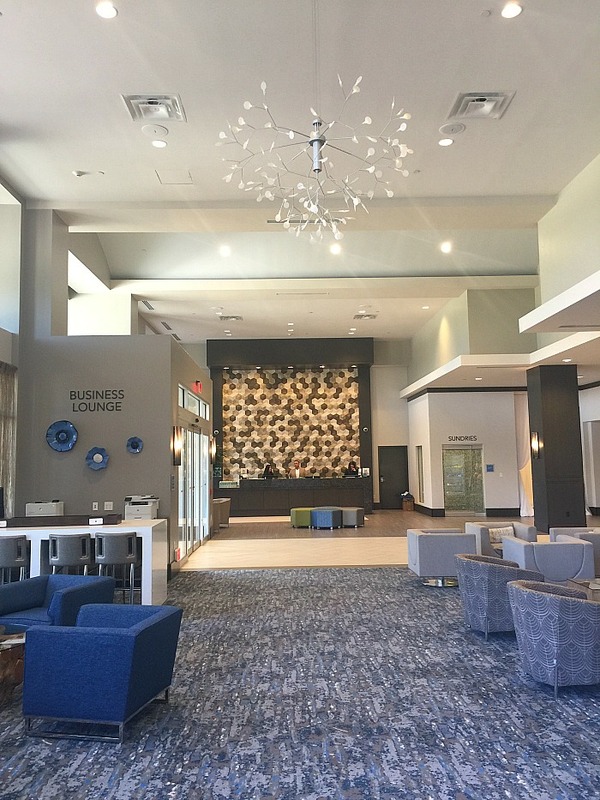 There are many places to stay in The Woodlands, with every budget in mind. 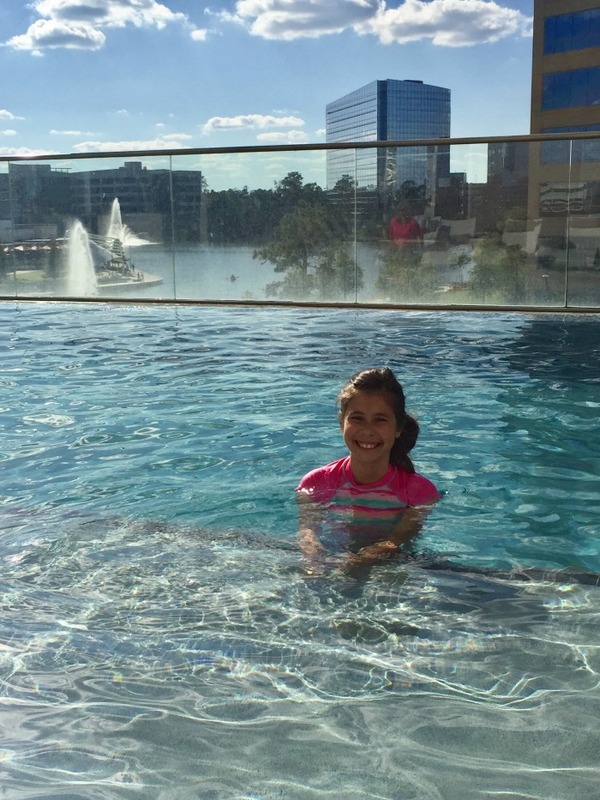 Our weekend getaway involved home base at Embassy Suites The Woodlands at Hughes Landing. Perfectly located across from what’s called Restaurant Row, it’s a great spot for your family to rest, recuperate and head out for adventure. As with all Embassy Suites, each room is a suite and ours was a delightful corner suite with floor to ceiling windows at that. I don’t know about you, but any family with kids could use having that extra room for the kids to hang out in while parents pack, unpack and just handle things. I was pleasantly surprised that this suburban Embassy Suites had an outdoor pool (with an infinity view no less). Though smaller than a resort pool, it was refreshing after a long day of kayaking and hiking in The Woodlands. 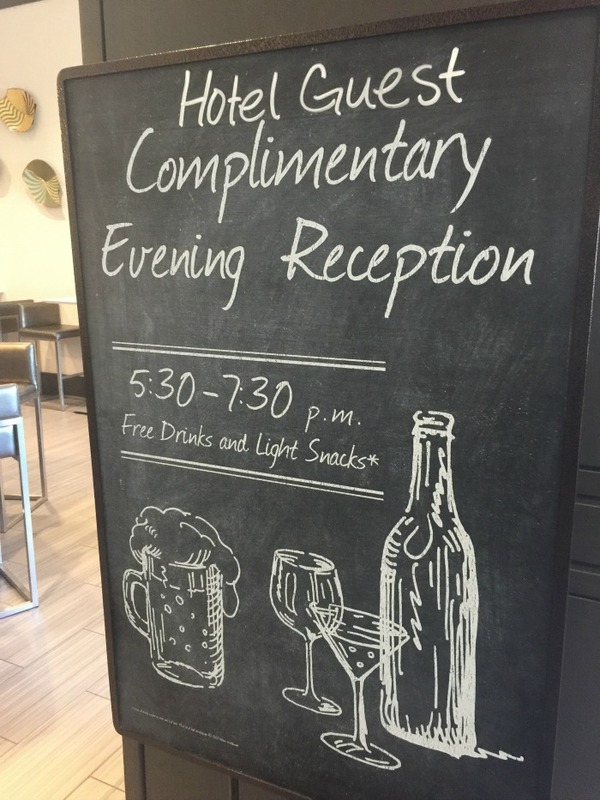 Great for families, we found the evening reception perfect to tide everyone over until dinner! This and a complimentary full hot breakfast buffet each morning made dining at Embassy Suites top for families! Of course, if you happened to have made dinner reservations on Restaurant Row, you can just walk out the door and cross the street. There you’ll find places like Fogo de Chao, Del Frisco’s Steakhouse, Escalante’s, California Pizza Kitchen and more. While we chose the traditional route of driving our car everywhere, had we had just one more day we would have taken advantage of the fun transportation that is part of what makes The Woodlands such a unique destination. 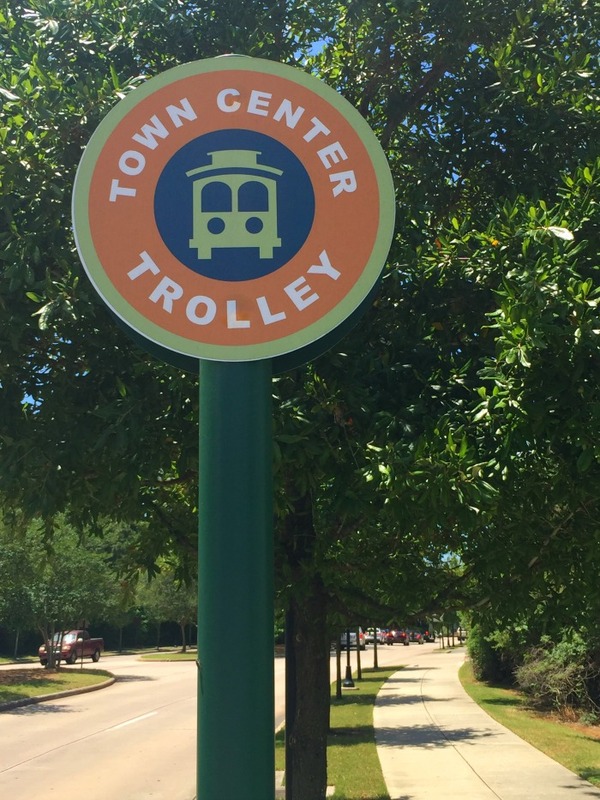 Free to all, you’ll find waterway trolleys and cruisers available to explore on all days but Thanksgiving, Christmas and New Year’s. Kids always find it adventurous! Cynthia Woods Mitchell Pavilion – #2 outdoor amphitheater in the world (according to Pollster Magazine) with artists over the years like Elton John, Bruce Springsteen, and John Legend. So how did The Woodlands handle my challenge? Let’s just say we had full bellies (yet worked off our meals with our adventures) and big smiles! Memories made! 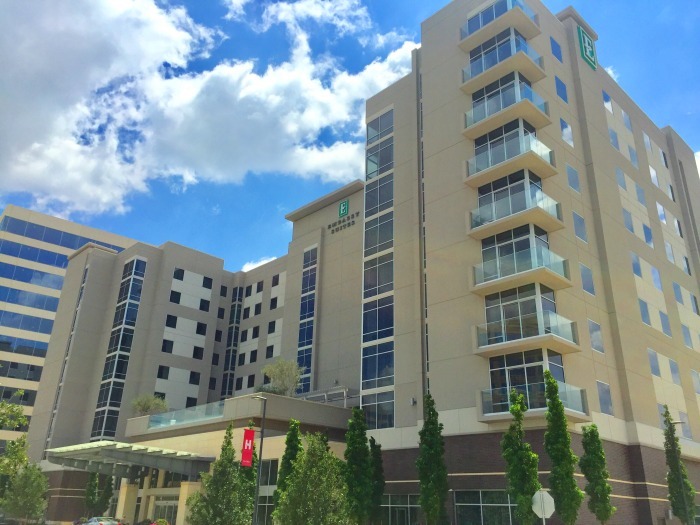 Consider The Woodlands TX for your next Texas getaway! We will be back! That looks like SUCH a fun family getaway! I might just have to replicate it the next time we plan a quick weekend trip! The best part is that there is something for everyone, the outdoors lover or the shopper or the foodie (the list goes on and on)! Great article; my husband and I have never visited there. Thank you for sharing your memories! Thanks Margie! It definitely was a hidden gem (one that we had passed by on the freeway for far too long)! Oh my goodness! Who knew? Now I have one more awesome place to visit in Texas on my bucket list!! Definitely Cathi! I have a few more places to visit that I spotted while down there, so I will be heading back! It sounds like a win for a Texas getaway! You would really enjoy it Teia and it’s perfect for all the kids too! That food looks awesome! I’ve never eaten at a Tommy Bahamas!